Our SJS students spent the day performing service projects and the SJS parent community showed our school staff how much they are appreciated! 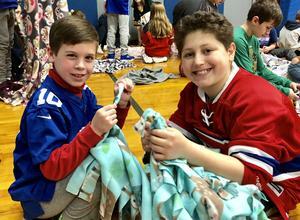 Our SJS staff was treated to an amazing breakfast while our students worked with prayer partners to make fleece blankets for the patients at St. Joseph's Children's Hospital in Paterson. Students also wrote encouraging letters to go with the cozy blankets! In the afternoon, students made nearly 2,000 sandwiches and packaged 150 lunch bags for the St. Joseph Social Service Center in Elizabeth. Students wore their favorite team spirit wear and continued with our Pennies with a Purpose fundraiser! To view all the photos from CSW Wednesday, click here.